Front row: Deanna Deising, Terry Aittama, Kelly Schoonaert. Back row: Corey Huck, Becky Konietzki, Cuiting Li, Sallie Scovill, Susan Turgeson. An increasing number of wellness practitioners are being asked to deliver training or coaching in the areas of resilience and thriving. 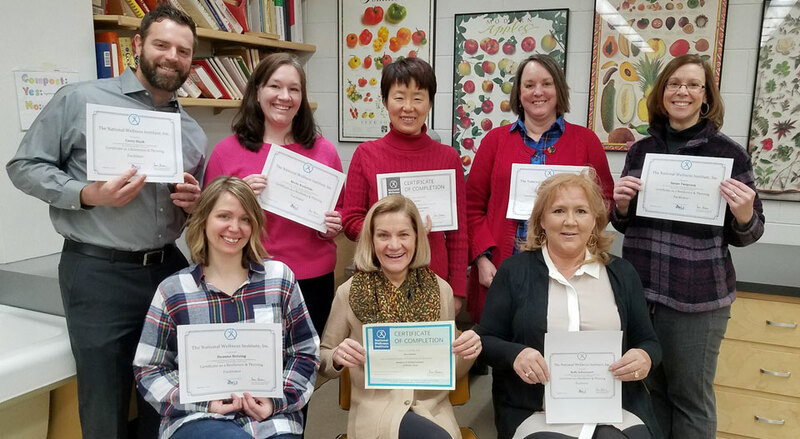 To meet this need, eight faculty and staff members from the UW-Stevens Point School of Health Promotion and Human Development completed the Resilience & Thriving Facilitator Certificate from the National Wellness Institute (NWI), in collaboration with Organizational Wellness Learning Systems (OWLS). Through evidence-informed tools and competency-based training, participants learned a new system that integrates NWI’s 6 Dimensions of Wellness model with the concepts of stress, resilience, and thriving, and also aligns with the NWI Wellness Promotion Competency Model.